South Londons favourite sons will return to what they do best this winter when Squeeze take to the road for their biggest UK tour in over 10 years! The boys will invite their fans to Spot The Difference at 21 dates across the country, kicking off in Bournemouth on 14th November and concluding by returning home to play three separate London venues in three days. Releasing their first EP the cheekily titled Packet Of Three – in 1977, Squeeze shot to fame thanks to the pithy kitchen-sink lyrics and new wave guitar music that have since become their trademark. Having numbered Jools Holland and Paul Carrack within their ranks, and working with the likes of Elvis Costello and Velvet Undergrounds John Cale, Squeeze became a fixture of the UKs music scene over the course of their 13-album career, before splitting in 1998. Despite tentatively reforming in 2007, Squeeze have so far refused to tread the well-worn reunion path by trading on their past glories, which have included hit singles on both sides of the Atlantic such as Cool For Cats, Tempted, Hourglass and Up The Junction. Instead they have gradually been re-establishing the informal live show that made them such favourites in the first place, their festival appearances and gigs to date honing the chemistry that saw co-founders and ever-presents Chris Difford and Glenn Tilbrook dubbed The New Lennon and McCartney. They are joined on this tour by fellow Squeeze favourite John Bentley, with the line-up completed by Glenns solo band-mates Stephen Large and Simon Hanson. This set of dates will cap an exhilarating 2010 for the Squeeze boys. In March they will have the site of their first ever gig in Greenwich commemorated by a PRS for Music Heritage Award, one of only a few bands to receive this honour alongside Blur and Dire Straits, while summer will find them playing to their fans in the USA Squeeze having long made a mockery of the belief that English bands cannot travel across the pond. Away from the band, both Chris and Glenn were involved in the Barbicans inaugural Songs In The Key of London in March, an event curated by Chris that brought together the likes of Elvis Costello, Suggs, Jools Holland, Phil Daniels and many more. Both continue to gig separately as well, with Glenn having released his third solo album Pandemonium Ensues last year, while Chris has also been busy recording his new album Cashmere If You Can, which will see a release through the innovative new Saturday Morning Music Club label. Chris and Glenn are hoping to spend this summer writing material together for a new Squeeze album next year. Over 30 years after Packet Of Three, will Squeeze fans be able to spot the difference? Certainly not if the infectious enthusiasm that the band still bring to their live shows is anything to go by! 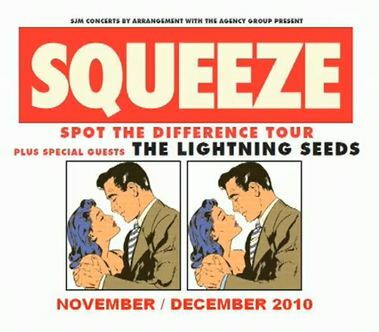 2 Responses to "SQUEEZE announce biggest UK tour in 10years"
Interesting comment from Chris. It sounds like they’ll be showcasing some new stuff, stuff that’s not even been written yet. So, “Spot The Difference” means that it’s more than just a run of the mill greatest hits tour because there’s some new material. I am glad tou are warming to the idea, it would be grat to hear some new stuff! !